Sun on Joe Baileys back; shaking flies away. Farmers and ranchers- keepers of the land. Barter for hope, for life, for a colt. A Joe Bailey rhyme chanted by children. proudly tacked to the wall. The stories of our countrys rich agricultural heritage are much like farming and ranching communities across America. Here today ... gone tomorrow. The Gonzales Joe Bailey Memorial Project seeks to preserve part of this heritage and has commissioned a documentary to memorialize the importance of the Quarter Horse breed to the American way of life as it occurred at the time Joe Bailey lived and the American Quarter Horse Association was formed. The documentary is being directed by award-winning Austin, Texas, filmmaker Chris Elley. On October 27, 2006, the Gonzales Joe Bailey Memorial Committee exhumed the remains of American Quarter Horse Gonzales Joe Bailey P-4, a horse designated as one of the American Quarter Horse Associations nineteen foundation sires. The remains were then entombed in a prominent, publicly accessible site located on the premises of a new multi-use equestrian and agricultural arena complex, the J.B. Wells Park of Gonzales, Texas. The J.B. Wells arena hosts numerous events, including a significant number of youth organizations such as Texas Youth Rodeo Association, Wrangler Jr. High Division Rodeo, Lone Star Youth Rodeo, Texas High School Rodeo Association, and 4-H Horse Shows. Sire to legions, legend to more. A life-sized, portrait-bronze statue of Gonzales Joe Bailey, to be sculpted by artist Lisa Perry of Springtown, Texas, has been commissioned. The finished bronze, displayed on a granite base, will cap the gravesite. The grave marker from Gonzales Joe Baileys original burial site will be incorporated into the monument. 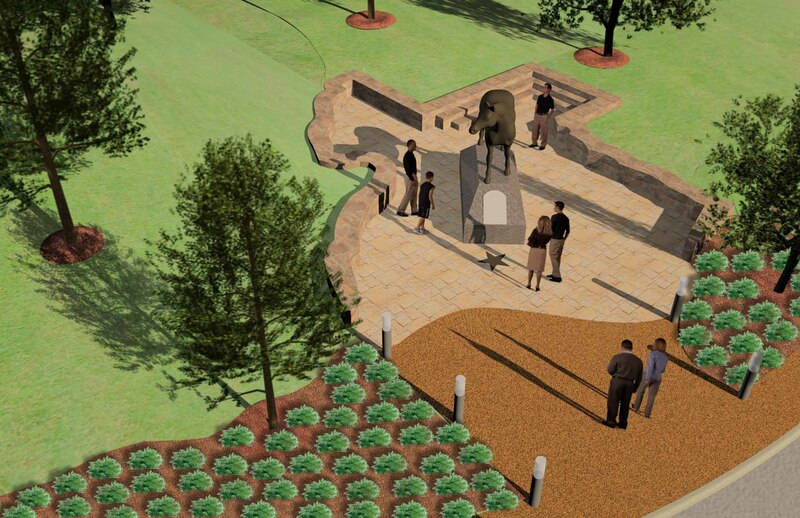 The architectural and landscape design for the memorial site reflects with dignity the historical significance of the project. 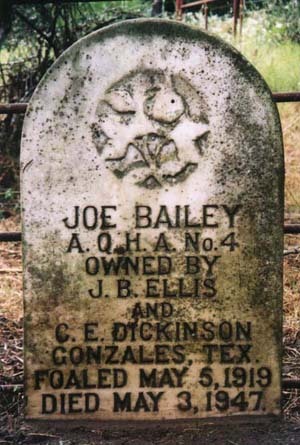 In May 2007, the Joe Bailey Memorial Site was awarded American Quarter Horse Historical Marker #29. The Gonzales Joe Bailey Memorial is an approved project of the Gonzales Community Empowerment Board nonprofit 501(c)(3).